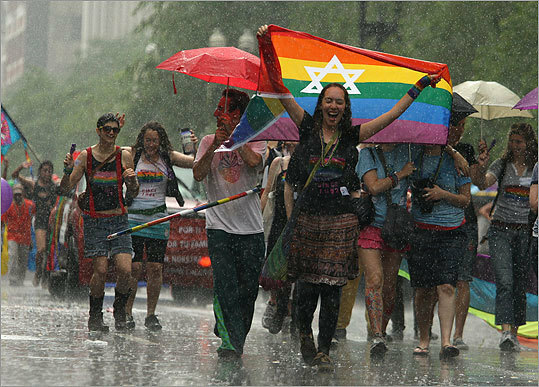 The rains on Saturday didn’t stop JOI Fellows and Alumni from marching in the Pride Parade with Keshet and the Workmen’s Circle. Their enthusiasm was captured in Sunday’s Boston Globe! Eliza Parad, current Fellow, is on the far left and Liz Manlin, JOI 08-09, is on the far right. This entry was posted in Our News and tagged Activism, Alumni. Bookmark the permalink.